It is a bizarre little war. For several weeks, the world has watched a motley force of rebel militiamen and a so-far-unseen, but probably quite small, government force, race to-and-fro on the main road south of Benghazi. The frontline reporting is brave but gives the impression that this is a regular military campaign. In television studios and in newspapers, arrows on maps show the advance and retreat of pocket-sized forces over vast distances (the Libyan coastline is 2,000km long) as if the Afrika Corps and the 8th Army were battling it out. They capture and recapture “strategic oil ports” and places that are just a scattering of houses. Since yesterday, rebel fighters without training or weapons, together with the foreign media, are being sternly forbidden from driving to the frontline. It must have become obvious to the rebel leaders in Benghazi that television pictures of their forces – essentially untrained gunmen in their pick-ups looking like extras from a Mad Max film – were damaging the credibility of the rebel cause in Europe and the US. 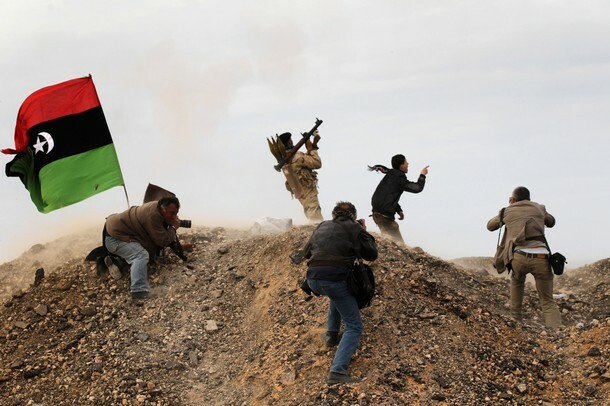 The new propaganda line of the rebels’ Transitional National Council is that professional soldiers, who have turned against Gaddafi over the last 40 years, will now take command and, in the words of one television reporter, “lick into shape the rag-tag militiamen”. But the new military leadership, which Britain, France and to a decreasing extent the US, will be supporting, inspires even less confidence than their men. The careers of several make them sound like characters out of the more sinister Graham Greene novels. They include men such as Colonel Khalifa Haftar, former commander of the Libyan army in Chad who was captured and changed sides in 1988, setting up the anti-Gaddafi Libyan National Army reportedly with CIA and Saudi backing. For the last 20 years, he has been living quietly in Virginia before returning to Benghazi to lead the fight against Gaddafi. It is these characters, and others like them, whom Britain is now fighting to install in Tripoli to replace Col Gaddafi. The accusation of Peter Galbraith, the deputy head of the UN mission in Afghanistan, later sacked, was that the crippling weakness of the US was that it had “no credible local partner in Afghanistan.” This is true in trumps in Libya. The Libyan militiamen look like a rabble even by the lowly standards of militias in Lebanon, Iraq and Afghanistan. They could only be effective if they were given enough training to act with foreign special forces calling in tactical air strikes every time they face an obstacle. This is what happened in Afghanistan in 2001 and northern Iraq in 2003. Even well-organised militias are dangerous to do business with because they are prone to paranoia, believing they have been sniped at or spied on by some innocent civilian. I remember, during a war between Druze and Christians south of Beirut in 1983, trying to persuade a Druze fighter that a toasting fork he had found in a house was not specially designed to out the eyes of Druze prisoners. So strong were his suspicions that he had been planning to shoot the Christian householders. There is still something extraordinary about the alacrity with which Britain has plunged into the dangerous but also comic opera world of Libyan politics. And it has done so despite the recent examples in Iraq and Afghanistan of what can go wrong when you join somebody else’s civil war – for that is what we have done, despite all the demonising of Gaddafi and glorification of his opponents. Life in Libya always seems to have a farcical but dangerous element to it. The first time I went in the early 1980s was to see the Libyan army withdraw from Chad. Somewhere in the southern desert, the vehicle I was in ran out of petrol in the middle of a minefield where we were stuck for hours. Later I was taken to see a model farm in an oasis which turned out to be abandoned. The only inhabitants were little green frogs hopping happily about amid the broken pipes and water-logged palm trees. For many years, Gaddafi’s aides, responding to the latest whim of the leader, would invite the foreign press over to interview him. These interviews seldom took place, and journalists would sit discontentedly in hotels waiting for their editors to let them go home. I found the best antidote to boredom was thick 19th century novels. To this day, Tripoli makes me think of Jane Austen, most of whose books I read lying on a bed in the Libya Palace Hotel. The mistake in Libya was ever to become involved in trying to impose a no-fly zone. This was only going to have an effect if it turned into a no-drive zone, and this works best when the enemy is unwary enough to drive around in tanks and armoured vehicles and rely on heavy artillery that can be destroyed from the air. If foreign military force was to be used to save the people of Benghazi from massacre, it would have been better to impose a ceasefire from the beginning. This would have to be policed by foreign forces, but it was and is an achievable aim. It is politically more neutral and avoids charges of reborn imperialism. It has not happened because the not-so-covert aim from the start was to get rid of Gaddafi. One advantage of Libya is that the failings became obvious quickly. Never has “mission creep” crept so fast. The failings of local allies are more obvious more quickly in Libya than they were in Baghdad or Kabul. The difficulty in breaking the military stalemate opens the door to a ceasefire agreement and a resort to political and economic pressure to displace Gaddafi rather than the present ill-considered war.